It’s that time of year again. The familiar faces of Sharon, Louis, Simon, Nicole and Dermot are gracing our screens every weekend, introducing their acts for the nation’s favourite talent show; The X Factor. With wildcard acts like Honey G and Brattavio regularly making headlines, you’d have to have been living under a rock to have missed all the X Factor news this year. So it’s hardly surprising that so many keen bingo players are making the most of the theme in Mecca Bingo’s X Factor bingo room. Fans of the show will know that The X Factor has a bonus hour of unseen extras on ITV2 called The Xtra Factor. Always sticklers for authenticity, Mecca Bingo have done exactly the same by treating us to a promotion in their X Factor bingo room called – you guessed it – The Xtra Factor. Thanks to Mecca Bingo, you don’t have to be a star singer to reap the rewards of the X Factor. In fact, you don’t even have to be a fan of the show to enjoy the great game-play and high prizes of the Xtra Factor promo. The promotion is totally simple and straightforward. 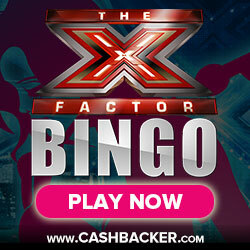 Throughout the week, the X Factor bingo room has a £50 jackpot prize up for grabs. Every weekend throughout October that jackpot will be doubled to a whopping £100. The Xtra Factor promotion takes places every Saturday and Sunday between the 1st and 31st of October 2016. The time to face the music will be from 9.30am to 11.30pm. All you need to do to get involved is head over to Mecca Bingo’s X Factor room during these hours and purchase your tickets. As long as you have an active Mecca Bingo account and reside in the UK, you qualify for the doubled-up prize in The Xtra Factor promo. Brand new customers are welcome to join the fun, so if you haven’t signed up for the site yet, what are you waiting for?